TALS 600 Fly Fishing System in action. It organizes itself and lends you a hand. The TALS #35 & #25 Fly-Tubes. TALS 600 Fly Fishing System comes with 6 TALS tubes as above. The TALSTM 600 Fly Fishing System features the newly innovated TALS Fly Tubes which have a unique twist action, side window opening allowing easy access to the entire contents of the tube. 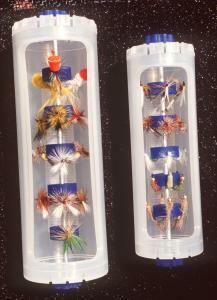 Inside a rotating carousel complete with Fly Grabber discs allows easy and secure fly storage and selection without hackle damage. Tubes simply hook & loop attach inside pack. Ventilation allows for constant air drying of your flies when tube is closed. Pack has a spacious front pocket with 2 side D-rings for accessories and a fold down, hands free, work table/rod holder complete with elastic straps to secure pliers, hook remover, pen light, knot tier, knife and more. A six-point comfort harness system forms a chest pack, waist pack, or satchel. 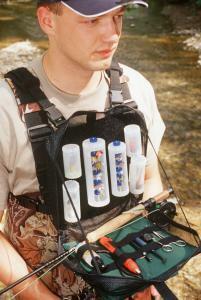 Pack comes complete with 1 large and 1 medium sized Fly Tubes and 2 small and 2 medium "Popper and Streamer" storage tubes (as pictured). 6 tubes total will hold 150+ flies/streamers. Pack dimensions 10”x 9"x 4". Will adjust to fit a 65 inch chest or waist. To read full version of TALS 600 press release click here. 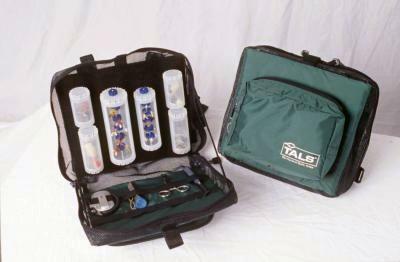 "(TALS 600) Perfect fly fishing system, great for traveling. Versatile. " 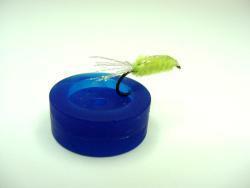 "The TALS System makes carrying flies easier and much more manageable. I like the way the flies dry inside the TALS tubes. It (TALS 600) really helps when fishing with waders." "I really like this chest pack (TALS 600). It made it very easy to change flies as I was wading the creek. The overall product is excellent."